This week in the world of STO, the developers have gotten around to righting a few wrongs that have persisted since launch. Tune in to hear the tweaks that will make everyone a little happier! And then, in the interest of making you even happier, we’ll have a heart-to-heart interview with Cryptic’s Online Community Rep, Shaun “Stormshade” Brodie. And last but certainly not least, Cryptic launched the highly-anticipated first mission in a new series of Featured Episodes, and the boys from STOked were there to give you their hands-on impressions of “The Vault” from top to bottom. C-Store ships now available for (many, many, many) in-game currency. Level 41/RA/BG Rank Excelsior is now available, for 200 marks. Hints at a possible scale revision for The Defiant? There is a certain Defiant skin that is better scaled than the current version, when compared to shuttles and DS9. Undine World-destroyer … or Tholian Web?? Borg arm weapons … possible additions for Borg Boffs/Captains? 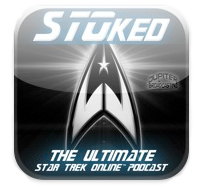 This story includes descriptions of upcoming episodes not available on STO.com yet!